I hope you have a wonderful Thanksgiving next week, and I also hope you get to spend some time at “the kids table.” I’m like Peter Pan, I never wanted to grow up. I miss sitting at the kids table on Thanksgiving. Think about it… no one argues at the kids table about grown up stuff, like politics or taxes or how your brother-in-law is such a huge disappointment. And the scariest thing at the kids table is not ISIS, it’s yourAunt Debbie’sCongealed Salad. Monday, November 16th – It was an especially busy Monday. Kara and I put the finishing touches on a complicated RFP response. I wrote two press releases for clients and we had a productive meeting about our new website. The kid in me was sad that I didn’t get a piano lesson on Friday, because my awesome — and might I add extremely patient — piano teacher, Miss Tonya, was under the weather. By the way, the folks at Bravo Music Academy are super nice and super talented. On Monday afternoon, the UPS guy delivered 1,000 bottles of our latest and greatest invention – Bold Brand Water. Ingredients: 2 parts Hydrogen, 1 part Oxygen. At Madison+Main, we believe that you can brand anything. 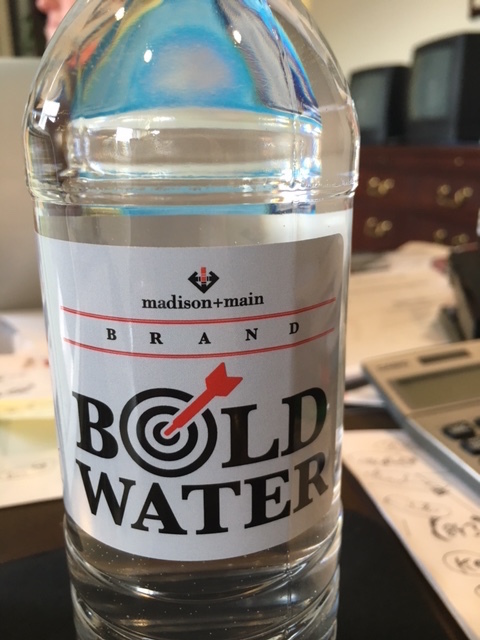 Bold Brand Water comes to you from the confluence of the Jackson & Cowpasture Rivers. flowing past power plants and paper mills. The journey ends when we filter it, bottle it, and make a toast to tastelessness. Wednesday, November 18th – After a busy morning working with the creative crew, I dropped by theJepson Alumni Center at the University of Richmond for the Virginia Council of CEOs quarterly luncheon. Linda Nash – formerly of the Childcare Group, the Compass Schools, and PartnerMD – was the luncheon speaker. Linda outlined 9 steps to success. My note-taking ability is horrible, but this is what I think she said. 1. All investors are not equal. 2. Keep your eye on the exit. 4. Know when it’s time to jump. 6. Do more listening than talking. 7. Address issues (almost) immediately. 8. Keep your eye on the ball. Thursday, November 19th – On Thursday morning it rained. Again. And no one in RVA knows how to drive in the rain. As a result, I was late for my meeting at Structured Cable of Virginia. Thankfully, co-owner Dee Straub is a nice guy and didn’t tease me too much about it. Dee and company do a great job providing security and entertainment technology for homes and businesses. Check them out at www.structuredcableofva.com. 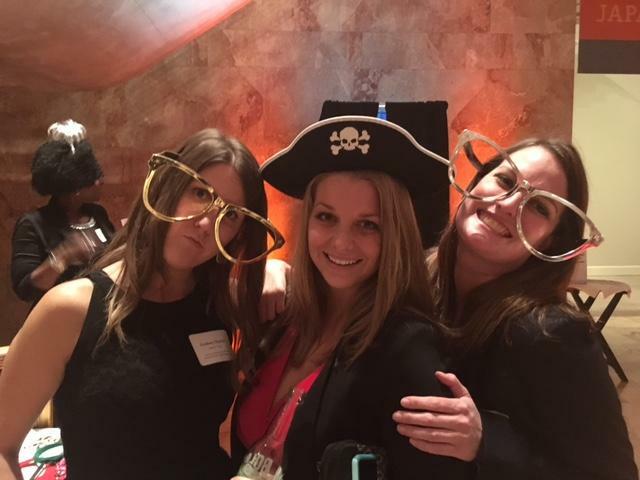 On Thursday night, the Madison+Main-iacs descended upon the VMFA for the Comcast SpotlightClient Appreciation Party. Thanks to our rep Myra Watkins for the invitations and this year, Art Director Renita Wade won an iPad mini, and Account Manager, Lindsey Durfee scored big time with a 42″ Smart TV. Speaking of the weather, I just found out there is a contest where you can vote for RVA’s favorite weather caster. The Richmond area’s 2 leading contenders are CBS6’s Nikki-Dee Ray and WRIC Channel 8’s Katie Dupree. We think they’re both awesome and because they were both judges at our chili cook off, we’re not going to take sides… but you can. Vote here for your favorite weather forecaster.